Coal’s making a comeback after five years in the doldrums. Power-station coal has surged this year, outpacing both oil and natural gas, as China’s efforts to reduce mining capacity boosts domestic prices and increases the appetite for seaborne imports, according to UBS Group AG and Australia & New Zealand Banking Group Ltd. 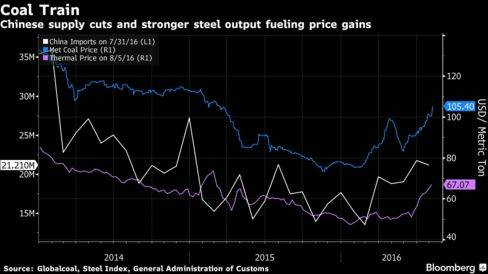 The steel-making variety of coal is at the highest in more than a year, further supported by robust Chinese steel output. Coal’s decline began in 2011 amid a global glut, then deepened as China slowed overseas purchases. Efforts this year to reduce the country’s output have boosted domestic thermal coal prices and spurred a revival in imports after they slumped in February to the lowest since 2011. While shipments eased in July amid a wider drop in energy imports, they remained above 21 million tons for a second month and near the most since December 2014. Newcastle thermal coal, an Asian benchmark, is up more than 30 percent this year and reached as high as $67.07 a metric ton in the week ended Aug. 5, according to data from Globalcoal. Prices are on track to snap a five-year streak of declines. Metallurgical coal advanced almost 35 percent this year to $105.40, the highest since March 2015, according to data from The Steel Index. Prices are still far from recent highs. Metallurgical coal hit a peak of about $300 a ton in 2008, when flooding in Australia curbed output. Thermal coal at the time rose to almost $195. While the coal glut has disappeared and Citigroup Inc. predicts growing deficits for both thermal and metallurgical in 2017, oil and gas markets are each contending with surpluses. Brent crude prices are up about 24 percent so far in 2016, while U.S. natural gas has gained roughly 8 percent. China is seeking to cut as much as 500 million tons of production capacity by 2020, equivalent to about 9 percent of its total, as the country seeks to trim industrial oversupply and curb pollution, the nation’s State Council said in February. Coal output fell 2.7 percent in July from the previous month to 270 million tons, according to data Friday from the National Bureau of Statistics. Output is down 10 percent during the first seven months of the year. Authorities have cautioned that mines are shutting too slow to meet year-end targets. Reductions during the first seven months of 2016 equaled about 95 million tons, or roughly 38 percent of this year’s goal, according to a statement posted online Thursday by the National Development and Reform Commission, the country’s top planner. China’s increased appetite for imports is a boon for miners from Glencore Plc to BHP Billiton Ltd., the world’s biggest shipper of metallurgical coal. They were among companies to shut operations, halt development projects and cut jobs as falling prices squeezed margins. Chinese steel output reached a record daily volume in June as mills in the world’s top producer boosted supply to take advantage of rebounding prices. Imports will likely ease in the coming months as peak summer power consumption starts to fade, said Guo Chaohui, an analyst at Beijing-based China International Capital Corp. Demand for seaborne coal in the long term will depend on whether the government decides to relax its efforts to trim capacity after the recent price gains, he said. China enacted a raft of policies in 2014, including higher quality specifications and import restrictions, to protect domestic suppliers.